Supernatural or Otherworld beasts in Irish, Scottish and Manx mythology and folklore. The Péisteanna are monstrous beasts occasionally encountered in the early literary traditions of Ireland, Scotland and the Isle of Man, particularly in those stories concerned with the lives or adventures of famous Medieval saints. They are usually presented as subterranean or lake-dwelling creatures, especially on the lake-bed, and the name itself is derived from the Latin word beistia “beast” rather than any indigenous term suggesting an external source. The predominance of Péisteanna in the ecclesiastical rather than heroic literature of Ireland and Scotland (along with their Latin-derived name) strongly indicates an origin in Judeo-Christian mythology. In both countries a wide range of religious and secular texts in Latin, Greek and Hebrew were studied, interpreted and debated (producing in the process some of the finest intellectual and philosophical minds in the Medieval world). In these sources serpentine and water-related beasts were plentiful, whether it be the Serpent in the Garden of Eden, the snake-like imagery associated with the demonic figure of Satan (Modern Irish Sátan) in the Old and New Testaments, or even the legend of the Leviathan (or the Hebrew Tannin) which was quite popular in the Middle Ages. Additionally the frequent application of the Latin term dracō “dragon, serpentine monster” to incarnations of evil in Medieval Christian texts (not least in the Vulgate of Saint Jerome) readily lent itself to the development of vaguely similar creatures and narrative themes in religious and secular literature. However this does not entirely discount influences from native mythology, particularly the imagery associated with the Fomhóraigh and stories of various Otherworldly beasts. Nor the tradition that survived the conversion to Christianity in Ireland and Scotland which placed the “pagan” afterlife or world of the gods beneath the surface of the earth, accessible though ancient burial mounds, caves and lakes. In addition from an Indo-European point of view it is worth noting the greater prominence of such creatures in the cultures of the Germanic and Scandinavian peoples, whether England’s serpentine-dragon Wyrm in Beowulf (also described by the Latin title dracō) or the equally serpent-like Fáfnir from Norway and Iceland. These supernatural monsters are frequently associated with underground or watery places, though they too – at least in the case of Beowulf’s dragon – may have been influenced by early Christian myth (itself drawing upon Roman, Greek, Hebrew and Middle Eastern lore). 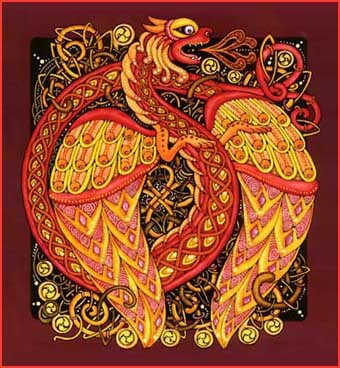 A reference should be made here to the issue of dragons and in particular the all too popular “Celtic dragon” (Modern Irish dragún). In fact no such creature exists in any of the early literary narratives or histories of Ireland, Scotland and the Isle of Man. The only genuine references to “dragons” in a Celtic milieu is in Wales where they are almost certainly derived from late Roman and Romano-Christian sources (as well as much later Medieval heraldic developments). Though these contain their own historic validity it does not give them any deeper Celtic antecedence. Those dragon-like creatures that did appear in so-called European dragon-lore are very different from how dragons are viewed now in contemporary Western culture. Most were wingless, serpentine in nature, associated with caves and watery places, and may or may not have been limbless. Though occasionally their blood was thought to be noxious or poisonous they did not fly or breathe fire. Such characteristics owe more to literary developments from the 18th century onwards than anything found in the original body of Medieval dragon-lore. Though, as we have seen, authenticity itself is a nebulous concept. In the later folk traditions of Ireland, Scotland and Mann stories of the Péisteanna became somewhat more plentiful under the guise of serpentine like water beasts, encountered in remote lakes or sea coasts, and they were part of the same folkloric milieu as the Eich Uisce. 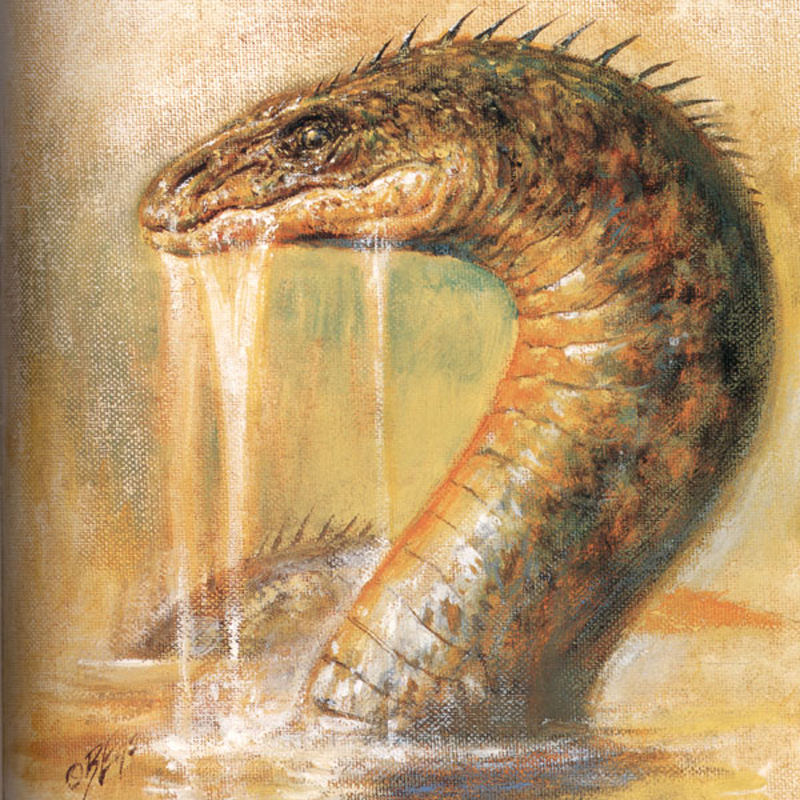 In the mythological or folkloric context Péist can be best translated as “(serpentine) water beast”, while Ollphéist simply means “Great (serpentine) water beast”.